Last week’s economic readings included reports on sales of new and previously-owned homes, and weekly reports on mortgage rates and first-time jobless claims. Home sales were lower in July, with new and pre-owned home sales falling short of projections and June sales. According to the Commerce Department, new homes sold at an annual rate of 627,000 sales as compared to 640,000 new home sales projected and a pace of 638,000 homes sold in June. Downward revisions for previous months contributed to a lower sales pace reported in July; but the average price of a new home was $3278,700 in July, which may indicate that home prices are tapping out. July prices dropped 1.70 percent from June but were 12.80 percent higher year-over-year. Sales of previously-owned homes were also lower in July with an annual pace of 5.34 million homes sold as compared to the expected reading of 5.40 million sales and June’s reading of 5.38 million sales. July’s reading was the lowest in two and a half years and indicated that low inventories of available homes coupled with high home prices has sidelined would-be buyers who can’t find or afford homes they want to buy. The National Association of Realtors ® reported that Inventories of homes were 0.70 percent lower in July after rising in June. Sales of pre-owned homes were 0.50 percent lower in July and were unchanged year-over-year. Freddie Mac reported lower average mortgage rates last week; the rate for a 30-year fixed rate mortgage fell two basis points to 4.51 percent. Mortgage rates for a 15-year fixed rate mortgage averaged 3.98 percent and three basis points lower than the prior week. Rates for 5/1 adjustable rate mortgages averaged 3.82 percent and were five basis points lower. Discount points averaged 0.50 percent for fixed rate mortgages and 0.30 percent for 5/1 adjustable rate mortgages. First-time jobless claims fell to 210,000 claims filed as compared to an expected reading of 215,000 new claims and the prior week’s reading of 212,000 first-time jobless claims. 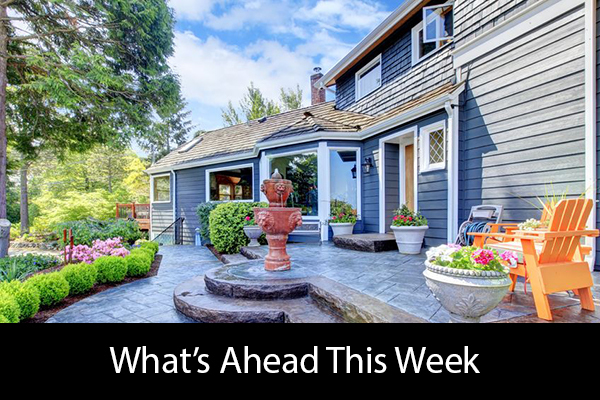 This week’s scheduled economic reports include readings from Case-Shiller’s Home Price Index, pending home sales and inflation. Weekly readings on mortgage rates and new jobless claims will also be released.